The Kodak Easyshare V803 is a stylish point and shoot digital camera with an 8 megapixel sensor, 2.5 inch LCD screen and 3x zoom lens (36-108mm), available in no less than 8 different colours. The ISO speed goes up to 1600 and there's a digital anti-blur mode to help prevent camera shake. Kodak Perfect Touch Technology promises to enhance shadow detail and deliver more vibrant colors, whilst 22 scene modes including panoramic stitching should cater for most situations. A new feature called "Maintain Settings" stores your preferred settings for flash, white balance, ISO and image resolution. So far, so good, but the headline feature has to be the price. The compact camera market is moving at a rapid pace, so much so that Kodak are offering the V803 for just �149 / $199 (it's available even cheaper online). Looking at the specification of the Kodak V803, that's certainly excellent value, but does the camera live up to its billing? Find out now by reading our latest in-depth review. Kodak certainly haven't cut corners when they designed the V803 camera. It's one of the more stylish digital cameras that you are likely to see, with a slim, black and silver all-metal body, rounded corners that help avoid that boxy feel, impressive LCD screen and solid build quality. The V803 will certainly gain admiring glances from your friends. It has a pleasingly minimalist design, with a row of buttons across the top, a column of buttons down the rear, and the zoom and navigation buttons. At 10.3cms it's quite wide for a compact digital camera, but at the same time it's also light at just 140g without the battery and memory card fitted. Kodak have obviously put a lot of thought into one of the main selling points of the V803, its design, and come up with a very distinctive looking camera that marks it out from other entry-level models. As this is purely a point and shoot camera with no manual controls, the Kodak Easyshare V803 is not overly complex in terms of the number of external controls that it has. I counted 13 in total. The majority of the controls are clearly labeled and common to most cameras, although a few, such as the Review, Share and Favorites buttons, are specific to Kodak models. Instead of a more traditional navigation pad, Kodak have used a small joystick to control the display mode, macro and landscape modes, and to change the exposure compensation. It's also used for things like zooming and selecting pictures during playback, and overall works very well. There are a couple of external controls that don't instill so much confidence. The cover for the USB is out of keeping with the rest of the camera. Positioned on the top right side, you have to prise it open with a fingernail, and it then hangs on a fragile looking plastic hinge. The printer docking port and power socket are exposed to the elements, but mostly the Kodak Easyshare V803 has a very substantial, quality feel about it that belies its budget price-tag. If you have never used a digital camera before, or you're upgrading from a more basic model, reading the excellent manual before you start is a good idea. Thankfully Kodak have chosen to supply it in printed format, rather than as a PDF on a CD, so you can also carry it with you. The large 2.5 inch LCD screen is the only way of framing your shots, so if you have to have an optical viewfinder, look elsewhere now. It's not too much of a loss, however, as the V803's screen is one of the better ones around, with 150,00 pixels and a bright, vibrant display. The various icons used to represent the camera settings on the LCD screen are clear and legible, and there is a handy warning icon which indicates if the photo is blurred or not (although it's only shown after the shot has been taken). 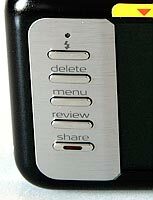 The main menu system on the Kodak Easyshare V803 is straight-forward to use and is accessed by pressing the Menu button on the left of the rear of the camera. There is a single main menu, with the Setup submenu at the bottom of the list of 16 options. Most of the camera's main options, such as white balance, image quality, auto-focus mode and ISO speed, are accessed here. It would have been good to see the more commonly used options, such as ISO speed, available via the press of a button, rather than having to go into the menu system. Due to the large LCD screen and restricting the number of on-screen choices to four, the various options and icons are clear and legible. Performance is where the Kodak Easyshare V803 starts to show its budget price-tag. The start-up time from turning the camera on to being ready to take a photo is slow at around 4 seconds. Zooming from the widest focal length to the longest takes around 2.5 seconds, and there are only 6 zoom steps from 36mm-108mm. Focusing is fairly quick in good light, although there is always a brief delay, and the camera achieves focus most of the time indoors or in low-light situations, helped by the focus-assist lamp. The visibility and refresh rate of the 2.5 inch LCD screen is perfectly fine. It takes about 2 seconds to store an image, allowing you to keep shooting as they are being recorded onto the memory card - there is a brief LCD blackout after taking each image. 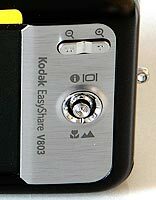 The Kodak Easyshare V803 has a poor Continuous mode which enables you to take just 1 frame per second at the highest JPEG image quality, up to a maximum of 4 images. Note that you can't use the Flash either in this setting. 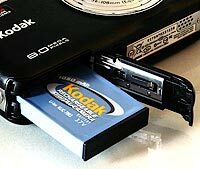 Overall the Kodak Easyshare V803 is slow in terms of operational speed. Once you have captured a photo, the Kodak Easyshare V803 has an excellent range of options when it comes to playing, reviewing and managing your images. Press the Review button and you can instantly scroll through the images that you have taken, view by date or album, sort images into albums, view thumbnails, zoom in and out up to 8x magnification, watch a slideshow with transition effects, delete, protect, crop and copy an image. Select the Perfect Touch Technology option to automatically improve an image in-camera. Press the Share button to print and email and to make an image one of your favourites, which can then be viewed via the Favourites button on top of the camera. Pressing up on the joystick toggles detailed settings information about each picture on and off, such as the filename and date, and there is a small histogram available during both shooting and playback. When taking a photo, pressing up toggles between the information view, no icons, the histogram and gridlines to aid composition. Overall the Kodak Easyshare V803 is an extremely easy-to-use, eye-catching and well built digital camera, with slow performance being the only problem area. PhotographyBLOG is a member of the DIWA organisation. Our test results for the Kodak Easyshare V803 have been submitted to DIWA for comparison with test results for different samples of the same camera model supplied by other DIWA member sites.